Despite the endless he said/she said between Apple and Android about who is winning the market share/global profits/units shipped popularity contest, the facts often seem to disagree with one another. While Apple has recently been crowing about stealing Android users, the latest information suggests it is losing ground to Android in the US and Europe. Market data from Kantar Worldpanel ComTech for the three months ending October 2015 show Apple losing a significant percentage of US market share, which almost perfectly mirrors the upswing in Android's share. The story worsens in Europe, with Apple simultaneously losing traction in what's called the EU5: the big five European countries of Germany, France, Italy, Spain and Great Britain. The numbers may seem to show a clear overall theme, that Apple is on the decline and Android is on the rise in both the US and Europe – enough for some to consider it a knockout punch – but the data is also perfectly capable of showing opposing facts. For example, the iPhone 6s became the third highest-selling smartphone of the quarter, providing Apple with quarter-over-quarter growth for the period. On the other hand, no individual Android vendor saw a significant rise in market share. Samsung and LG did well in Great Britain, Huawei did well in Italy and Spain, and Samsung performed well in France and the US. With the holiday buying frenzy upon us and due to heavily impact the numbers for the current quarter, things could change just as rapidly by the time the next report comes out. Kantar reports 14 percent of EU5 smartphone owners are planning to buy a new phone in the current quarter and if Kantar's data is anything to go by, iOS tends to do better at Christmas than Android. What do you make of these numbers? Which company will make your next phone? Share your thoughts in the comments. The only reason why people believe otherwise is Apple's "record numbers of people switching from Android to iOS" that they release at every earnings statement. It is deceptive because Apple A) doesn't reveal how many of their people switch to Android or B) the fact that an increasing number of people are simply going with multiple phones. Now that Apple is basically giving up on their attempts to create their own reality with advertising, they have now resorted to pressuring their own iPhone 5 customers to upgrade by pushing intrusive advertisements to their app store, like Microsoft has been doing to get people to upgrade to Windows 10. Could you imagine the negative headlines that the tech media would excoriate Google with if they pulled the same nonsense? If Apple is correct that 20% of iphone 6 buyers were Android owners, then these market share figures means there are lots of people leaving ios for Android. Well it's also due to the fact that almost all growth in global smart phone market is coming from new smart phone owners in emerging countries. Here Android rules and Apple iphone has no chance at all. So Android will pickup nearly all the growth in global smart phone market by default in the coming years. To be honest why do people still buy a iphone? Nevermind getting technical and pulling iphones apart internally but who wants a phone that looks the same as most of the people's phones that have iphones? With Android phones there's so many different looking phones to choose from, different UI's, different cameras and hardware to consider when purchasing a android phone. If you have a iphone it's the same as another iphone user's phone having the same model phone iow. What do iphone users talk about? Must be a damn boring conversation imho. That's not what's happening where I live (PHL.) 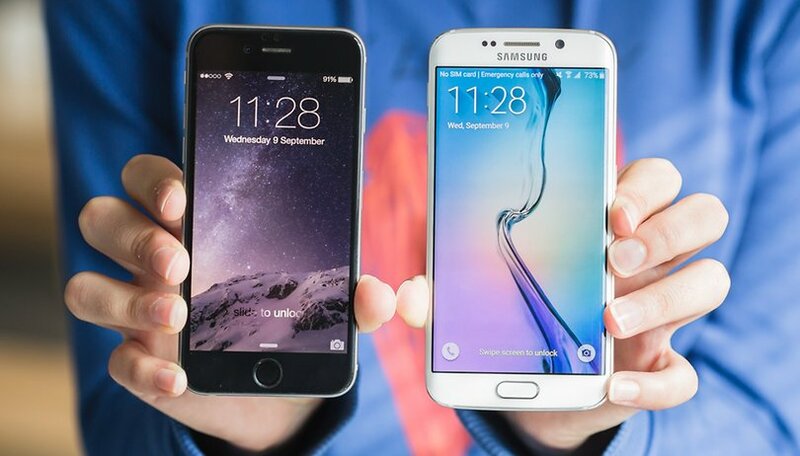 I see SIGNIFICANTLY more iPhone 6's(S'/Plus') than Galaxy S6's(edge/+) 3:1. Then again, where I live people think using a Galaxy S (The VERY FIRST one) is still a bearable experience and overall there are more Androids to iPhones, 3:1. It's all a matter of context. You may be seeing what you think are I Phones. They are the Chinese knock off running android. If you get close you can tell the cheaper ones easy they are all plastic, the better ones by the dual sim. That's what I see here in Cebu. Oneplus X and similar premium entry level android phones are the new iphone "knock offs". Before you know it, knockoffs will be better than the original! If Asus brings the Padfone S2 to the US, that will be my next phone.